I started with a frame of plastic canvas to give me a space to put her head. 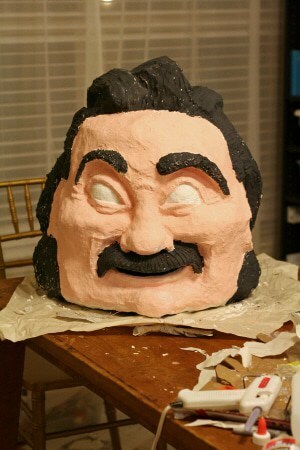 Then I used crumpled lumps of newspaper to get the basic shapes and did a layer of regular paper mache.Â Then, for the first time I tried the homemade paper mache clay recipe…and I’m definitely a fan!Â Helped me smooth out some features and build up the mustache. Even though I did paper mache the head did get a little too heavy for my original plan of mounting it on a helmet so I ended up mounting it on a back pack and it actually bobbled! I don’t know what I’m going to do with my giant Einstein head now that Halloween is over but I had a great time making it and I think it came out really well.Â Thanks for the clay recipe! Jonni, your site is INCREDIBLE. 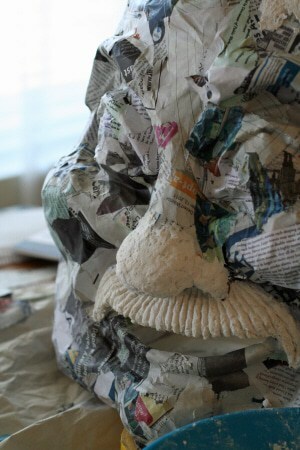 I am so excited to begin a paper mache project, and to use all the useful tips and advice you’ve so generously posted here. Hi Lucy. If you live in a humid climate, I would recommend using a varnish on all exposed paper mache, even the inside of your kettle. I don’t use spray cans very often, but I do have several cans of Krylon Clear around the house, and it words just fine. It dries really fast, but it doesn’t smell very good when you’re using it, so you might want to do it outside. What a beautiful project and one that could be educational as well. Do you have any children’s museums near you? 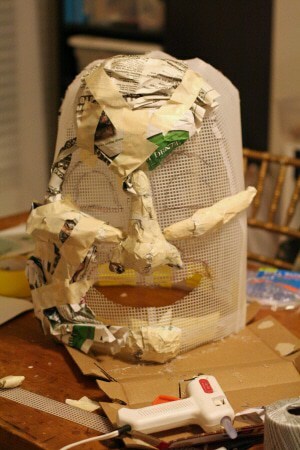 That looks like a project to make a life size version of your Einstein mask. Something that size will eat up a lot of space in the house.